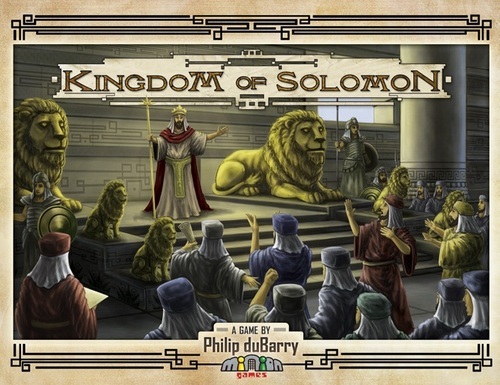 Kingdom of Solomon is a very fun game for 2-4 players and it takes about an hour to play. I have recorded a video review of the game that I will hopefully get up soon as well (after I figure out the best way to do that). I really liked this game a lot and from what I have heard of The Manhattan Project, Tahiti, and of the upcoming Hegemonic (currently on Kickstarter) combined with my love of Nile deLuxor - Minion Games is creating a real name for itself right up there with Rio Grande Games. A big SHOUT OUT to Minion Games for making this review possible and for making such great entertainment. Agricola - The fact that you take turns placing pawns out on the board and each space is limited to one pawn is very reminiscent of the farming favorite. Settlers of Catan -You obtain resources (by pawn placement instead of dice rolling in this case - I like this difference between Catan and Solomon) and you use them to build roads and to build "cities." Power Grid - The Market phase and the fact that you have limited resources reminded me a lot of the green wonder's energy game. Sell them high, buy them low. Make sure you have the resources you need. Roll Through the Ages - The fact that you can build different things that give you a special ability or advantage along with victory points reminded me of the great dice rolling favorite, RTTA. The temple building also reminded me of checking off little boxes, but here we are placing little cubes to represent the temple being built. It can trigger the end of the game like finishing monuments in RTTA, and it is another way to obtain victory points. What do you get when you combine all of these great elements? You get Kingdom of Solomon. I think that the game is very well done and I know that my wife and I really enjoyed it. I give the game 3 fingers up (or an equivalent 8 stars out of 10) rating. I can't wait to try out another Minion Game, seems like they are all fantastic. Check out their newest game Hegemonic on their Kickstarter page and check out what games are in your local store or check out Minion Games' website. This is a link to be able to buy the upgrade kit which includes a really cool promo card. Stay tuned for the video review or at least an update with some pictures. Buy a board game instead of a video game - and that is How Lou Sees It!